It’s not a secret I love Emily Dickinson. My blog’s title is taken from my favorite of her poems. I have visited her house twice and paid my respects at her grave twice in the last year and some change. Last Friday, I had an opportunity to hear a talk by writer Jerome Charyn at Amherst College. The title of his talk was “Did Emily Dickinson Really Exist?” Of course, Charyn chose the title to provoke. He has written two books about Emily Dickinson—one fiction and the other nonfiction. 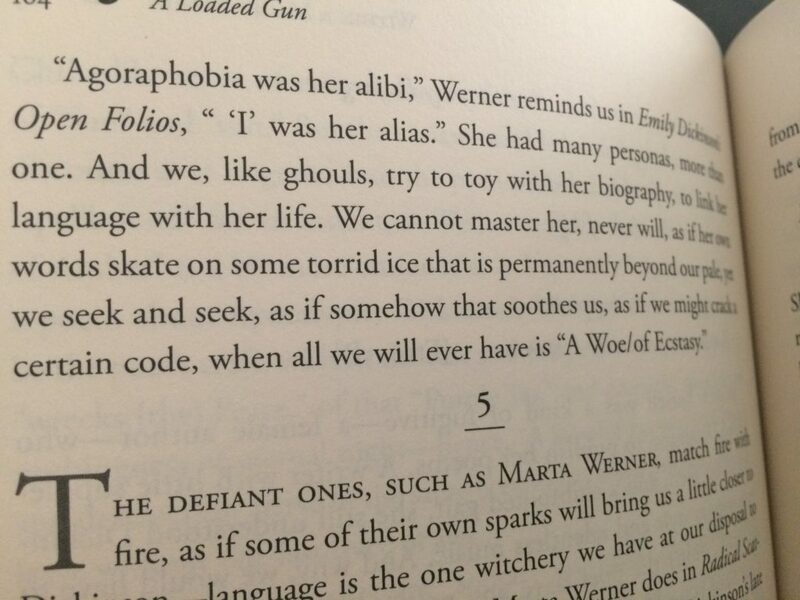 Steve bought me A Loaded Gun for my birthday, and I bought myself The Secret Life of Emily Dickinson after hearing his talk. The center of his discussion concerned a new daguerreotype believed to feature Emily Dickinson and her friend Kate Scott Turner Anthon. I believe the daguerreotype is copyrighted, so I won’t reproduce it here, but you can see it on Amherst College’s website. After hearing Charyn speak about the photo and also learning more about its provenance from the person who found it, I am fairly convinced it is Emily Dickinson on the left in the photograph. Of course, it’s true that many people would say the opposite, and the only way we’ll get to the bottom of it, finally, is if the FBI is willing to look into it with their special equipment. I have a feeling they don’t spend a lot of their time verifying suspected photographs of 19th century poets, though. The photograph’s owner let me take a picture of the copy of the daguerreotype that he brought with him. It is in a frame case that is nearly identical to the original and is the same size as the original. It’s not the best picture, so in order to see the photograph properly, please do check it out at the link I mentioned previously. As you can see, it’s about wallet-sized and would have been a personal photo—something carried in the pocket or placed in a drawer. It’s an intimate photo. Kate Scott Turner, pictured on the right, was wearing widow’s mourning. Emily’s dress was probably blue, green, or gray (I learned a lot about how we can determine colors from daguerreotypes). I didn’t know that because daguerreotypes were printed on silver, they do not pixelate. If you zoom into a photo on paper, eventually you get dots. Not so with silver. The photograph’s owner said that we really haven’t duplicated the quality of a daguerreotype with our modern technology. Of course, I thought that was fascinating. 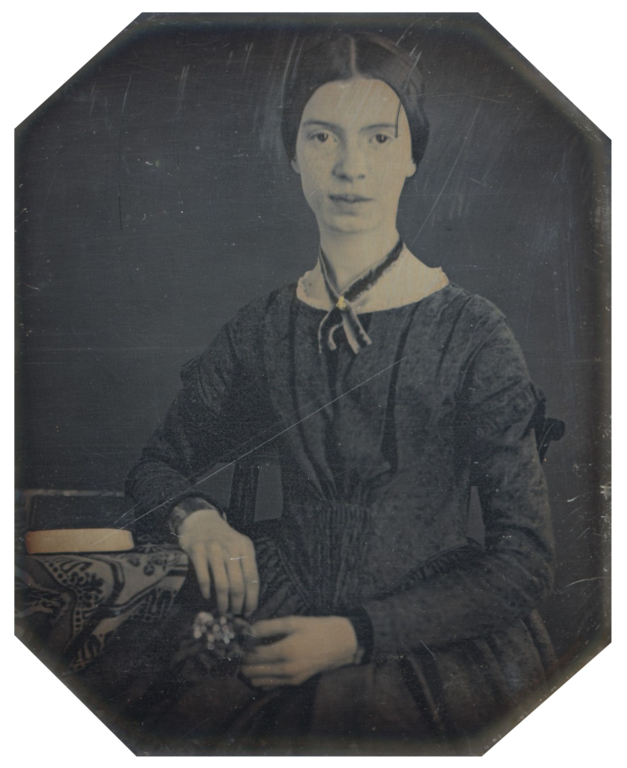 I learned that the known daguerreotype of Emily Dickinson was taken when she was a teenager, right after an illness, so she is a bit thinner than she otherwise would have been. The known daguerreotype has not been handled with care and has been damaged over the years. It was also made with older technology than this newer daguerreotype, and what happened was the edges of the daguerreotypes made with this older technology tended to warp the edges. 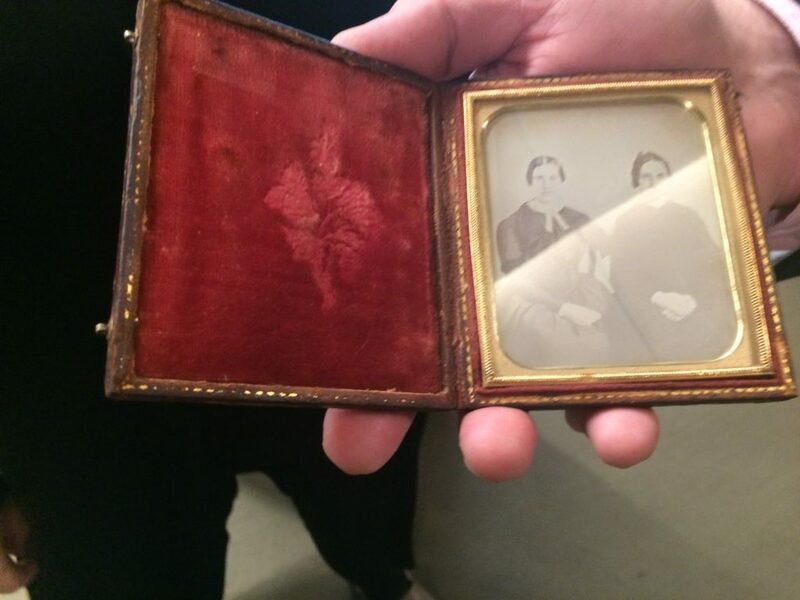 The “new” daguerreotype’s owner pointed out that Emily’s thumb looks like a lobster claw. Well, it does look weird now someone has pointed it out to me. He said that there was something wrong with the way her nose looks—large on one side and thinner on the other. He said this was likely due to the same issues with the older technology. He said that Dickinson’s family didn’t think this photograph was a good likeness. However, I think if you examine the eyes, they do look like the eyes of the woman on the left in the new daguerreotype. She had astigmatism, so there is a flatness to the eye on the viewer’s left that is similar in both photos. The mouth looks the same to me as well, as does the hair. I’m not a photographer, and I know very little about the history of photography, so I learned a lot I didn’t know. I have to agree, as an English teacher and a writer, that the comma Emily Dickinson uses after “portrait” is purposeful. She seems to be saying she used to have a photograph, but that she gave it away or doesn’t have it anymore for some other reason. The owner of the new daguerreotype believes that Emily gave the portrait to Samuel Bowles, a friend of both Emily’s and Kate’s. The daguerreotype’s present owner, who is a daguerreotype collector, bought the daguerreotype in a junk shop and was able to trace the provenance to Bowles. A lot of circumstantial evidence, yes, but it convinced me. I was intrigued by Jerome Charyn’s description of Dickinson as a “sexual predator.” I think that’s going a bit far, but the subject of his talk was her poem “My Life had stood—a Loaded Gun,” which Charyn claims is near impossible to explicate. However, he thinks that this poem, which he sees as written from the viewpoint of a gun, indicates that Emily herself is the loaded gun. Kate looks distinctly unhappy. Perhaps she was coerced to pose for this portrait and didn’t want to. Dickinson, however, projects confidence, looking boldly into the camera and putting her arm somewhat aggressively around Kate. Emily famously wrote letters to her sister-in-law, Susan Huntington Gilbert Dickinson. 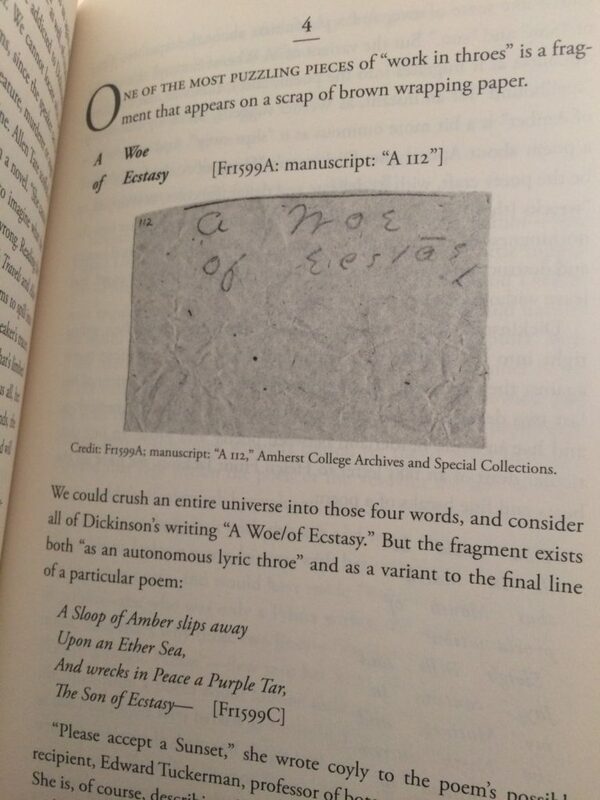 Charyn claimed in his talk that there is no way to read those letters except as love letters. Of course, I immediately ordered a copy of them so I could see for myself. He spoke so eloquently of how delightful her letters were that I felt I should read them myself. Dickinson’s sexuality has been the subject of some speculation for a long time. I don’t know enough about it to make a judgment, hence my desire to read her letters and poems and see what I can learn. I can’t wait to dive into Charyn’s books and Emily’s letters and learn more about her. The evening certainly gave me a lot to think about, and it didn’t do much to shrink my ever-growing to-read list. Charyn claims the more he learns about Dickinson, the less he knows. I was more intrigued by Emily Dickinson than ever after this talk. I loved the drive up to Amherst. The fall colors are gorgeous right now, and it was a beautiful night. It had been a long time since I did something that was geeky fun by myself. What do you think? Is this Emily Dickinson in this daguerreotype? Anyone want to “book club” Charyn’s books with me? Our middle school’s summer reading selection this year was Kwame Alexander’s verse novel The Crossover. It’s a book that has been on my radar since an English teacher’s conference I attended last November, but I hadn’t set aside time to read it until this weekend. It’s a very fast read, and I think the students will have enjoyed it. I know I did. The novel is told from the perspective of middle-school basketball phenom Josh Bell, nicknamed Filthy McNasty by his father, a legendary former basketball player named Chuck Bell. Josh has an equally impressive basketball-playing twin named Jordan, and the two boys attend school where their mother is principal. Things get complicated for Josh when his brother starts dating a girl and his father’s health problems take a serious turn. 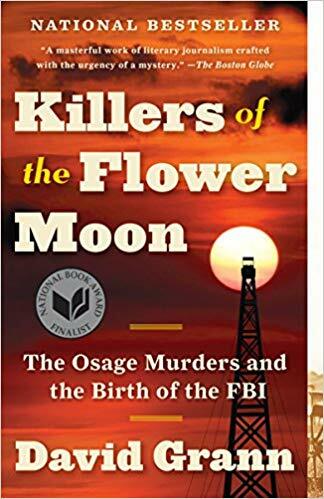 When one of my students read this book last year as an independent read, he said it was the best book he had ever read. I’m not going to go that far, but I understand why he said it. This student is not a big reader, and he plays hockey. Finally, he must have thought, here is a book about a boy like me, who loves the game with everything he’s got. I think it also opened up his notion of what poetry could be and do. I always say Kobe Bryant did us English teachers a solid by retiring with a poem. I think what happens too often is that our kids don’t see themselves in the books we select for them, and the boys who passed this book around my classroom last year saw themselves in this book. They also don’t see poetry as something that can be cool or that can speak to them. That’s something to thank Kwame Alexander for. 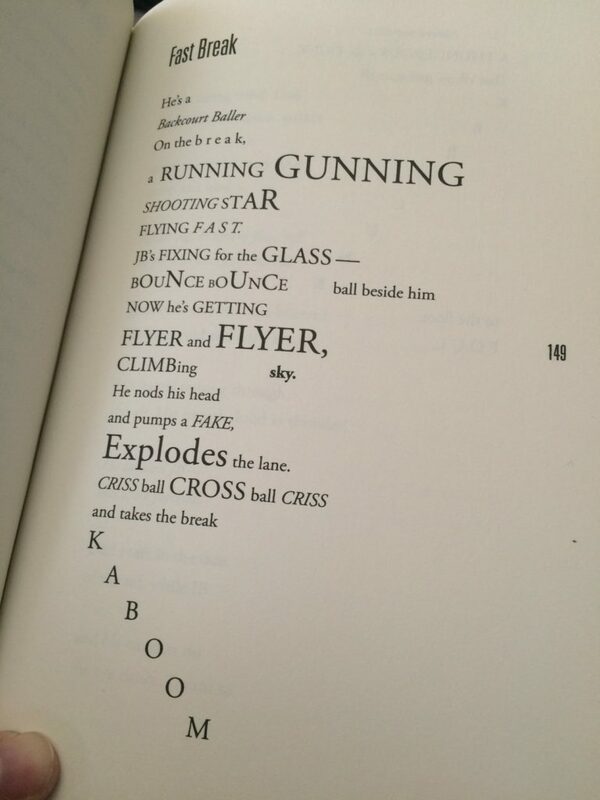 Some of the poems seem to mimic basketball on the page. Other poems are constructed in interesting ways. I am a big fan of poems in two voices. One of my students wrote an excellent one for a multigenre writing project she did on Robin Williams. In one voice, she wrote a monologue he had delivered as part of a comedy routine. In the other voice, she wrote what Williams was thinking as he spoke. When she presented to the class, she asked me to read Williams’s interior monologue while she read the comedy routine. It was an amazing poem, and I think we all felt its power, particularly when read aloud in two voices. Alexander includes a similar kind of poem in this book. 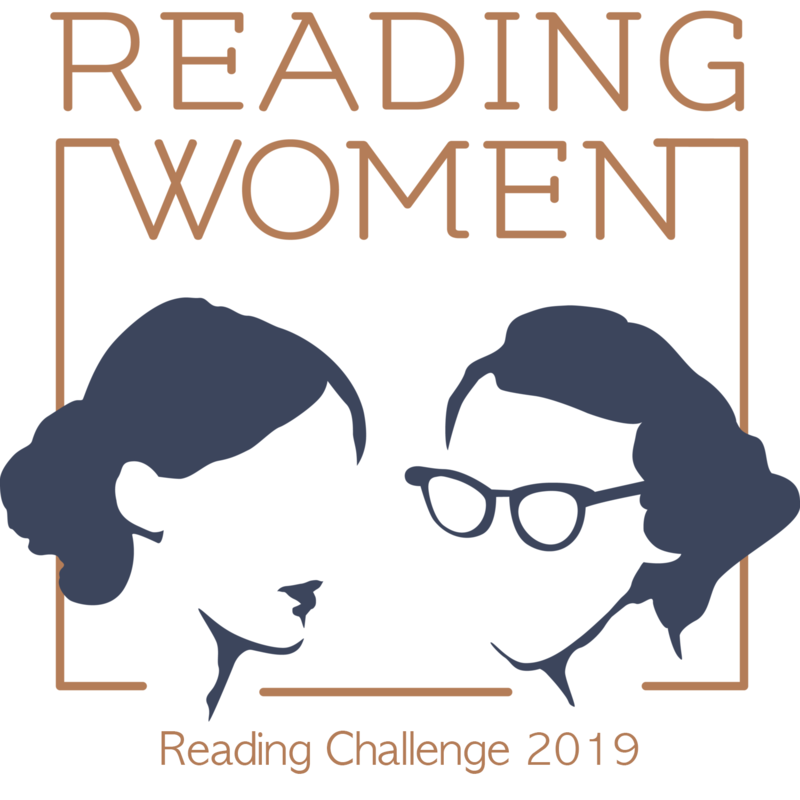 It can be read three ways: 1) as one poem, going back and forth; 2) as a second poem on the left, reading vertically; 3) as a third poem on the right, reading vertically. It works each way. 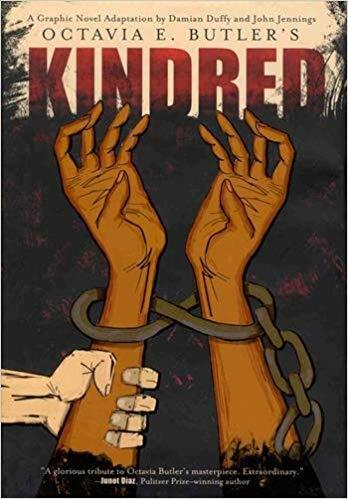 I can see why this book received so much praise from teachers and librarians as well as winning the Newbery Medal and the Coretta Scott King Award. Highly recommended to anyone who likes basketball, who likes to dip into children’s books on occasion, or who loves poetry. If you haven’t yet read Claudia Rankine’s multigenre blend of prose, poetry, art, and protest lyric Citizen: An American Lyric, do yourself a favor and pick it up. Particularly, perhaps especially, if you are white. Because you don’t understand, and even though reading a book is not the same as living the experience, it will open your eyes. 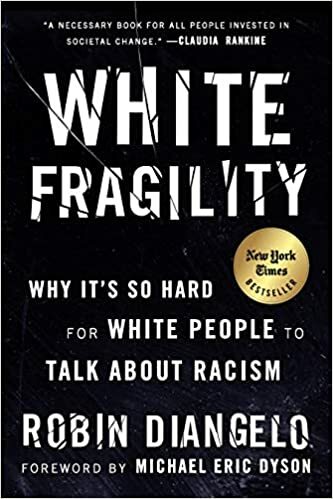 Some of what you will read in this book you think you know, but the bone-deep weariness of living in America and being black permeates every single page of this beautifully written book. Rankine writes about topics from the #blacklivesmatter movement to Hurricane Katrina to Venus and Serena Williams to Trayvon Martin to microaggressions. I think my favorite part was perhaps the extended section on Serena Williams. Many years ago, I used to follow tennis, but I haven’t really done so for about 25 years. So, I didn’t realize what Serena Williams had been through in her career, and it was educational to be sure. 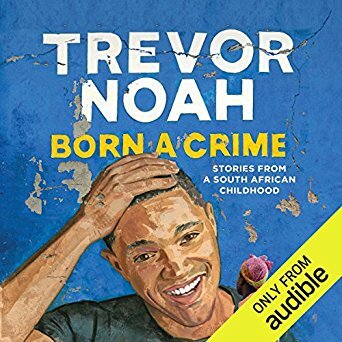 I also found section VI on Katrina, Trayvon Martin, James Craig Anderson, the Jena Six, and New York’s stop and frisk policy especially powerful. Each was described as a script of a situation video. 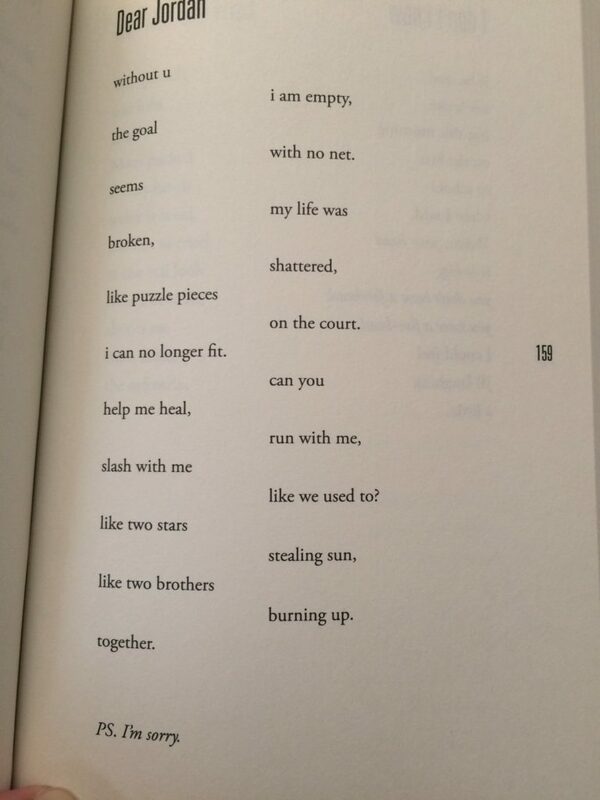 Rankine experiments with boundaries. At times, it’s hard to classify what, exactly the form is—poetry? essay? The resulting book resembles an assignment I have given my students in the past: the multigenre research project. In this assignment, students research a topic, but rather than write a research paper to show what they learned, they write poems, stories, and essays (any genre you can think of, just about) and use photographs and art to tell the story of what they have learned. They are immensely creative, incredibly interesting and inventive, and highly expressive. 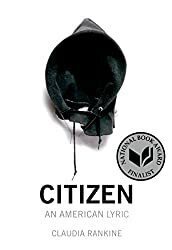 Citizen could probably best be classified as a multigenre book on the black experience in America. 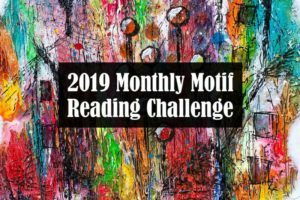 It includes criticism, prose, poetry, art, and photography. In fact, the chilling omission of a key detail on p. 91 somehow rendered the photograph (which is a famous photograph of a lynching) even more stunning and frightening, and I’m not sure how, but you really have to see it. Even the cover is a fascinating work of art. At first glance, I thought it was a black mask, but I realized it is actually a hood like you might find on a hoodie sweatshirt. I read Citizen in one gulp, and I probably should have slowed down to take it in because it deserves a thoughtful reading, but I couldn’t put it down. It’s one of those books I think I will be pressing into the hands of just about everyone I know. Powerful. Wow. 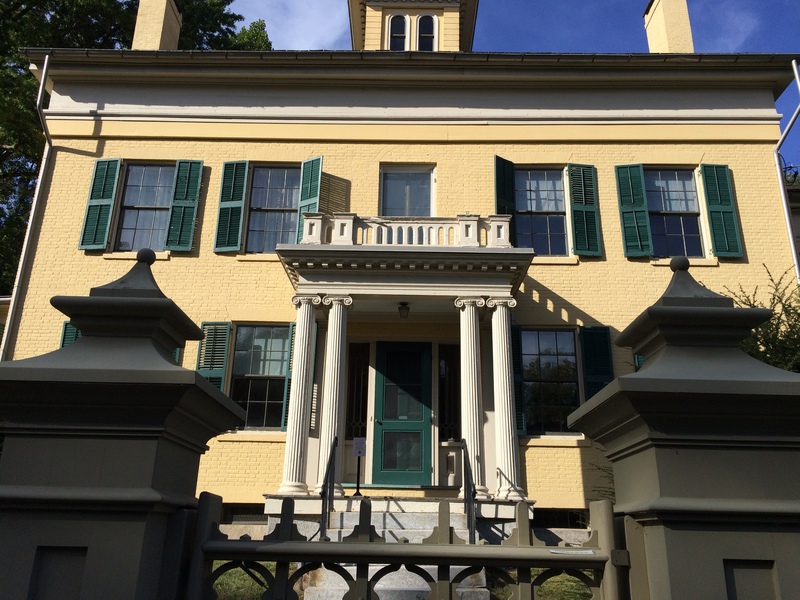 This weekend, I presented at a digital storytelling conference in Northampton/Amherst. 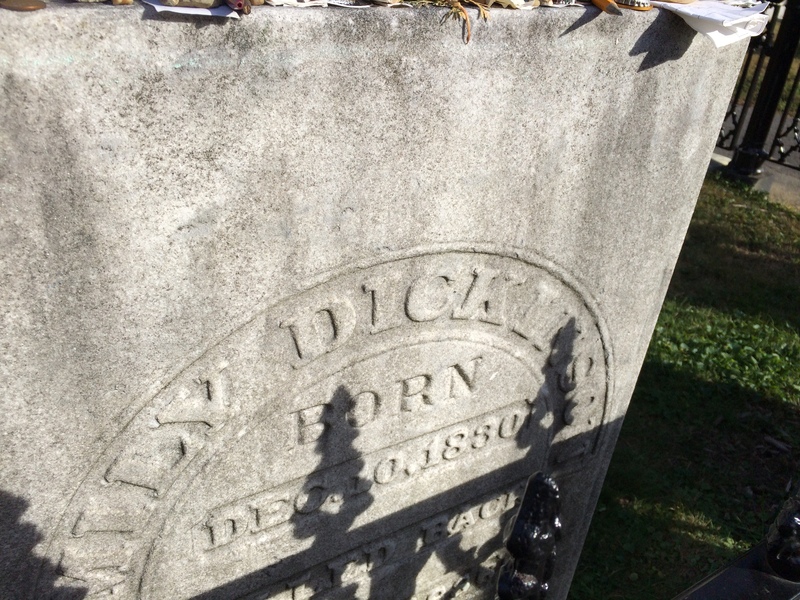 My family came with me, and we visited Emily Dickinson’s home (now a museum) and grave. Now, given the title of my blog, you might guess I’m a fan. I am not sure what it is about her poetry—the jarring dashes and slant rhyme, the ballad meter (on most), or the strong images. I like the way she thinks, and I find I agree with her about a lot of larger issues in life. The next stop is on the second floor. Sunlight shines through a window facing the front of the house, illuminating a replica of Emily Dickinson’s white dress. I nearly cried when I saw it. She must have been about the same height as me. A little more slender, though. About 20 years ago, I could have fit into her dress. The museum doesn’t allow pictures, but I sure wanted to break the rules to get a picture of that dress. You can find other pictures of it online, however. Finally, we saw Emily’s bedroom. She has pictures of George Eliot and Elizabeth Barrett Browning on the wall, and according to our docent, Emily’s niece Mattie attested to the fact that Emily did hang picture of those two writers on her wall (whether they are the exact same ones, I don’t know). Her actual sleigh bed is still in the room. A replica of her little writing table sits in the corner. The room has recently been restored with wallpaper reconstructed from the actual wallpaper that Emily had in her room. It was amazing to stand in that space where Emily wrote most of her poems. I can’t really even describe how it felt. We went outside to take a look at Emily’s gardens. Of course, she was a great gardener, but her garden doesn’t survive. Still, I found these beautiful purple flowers. 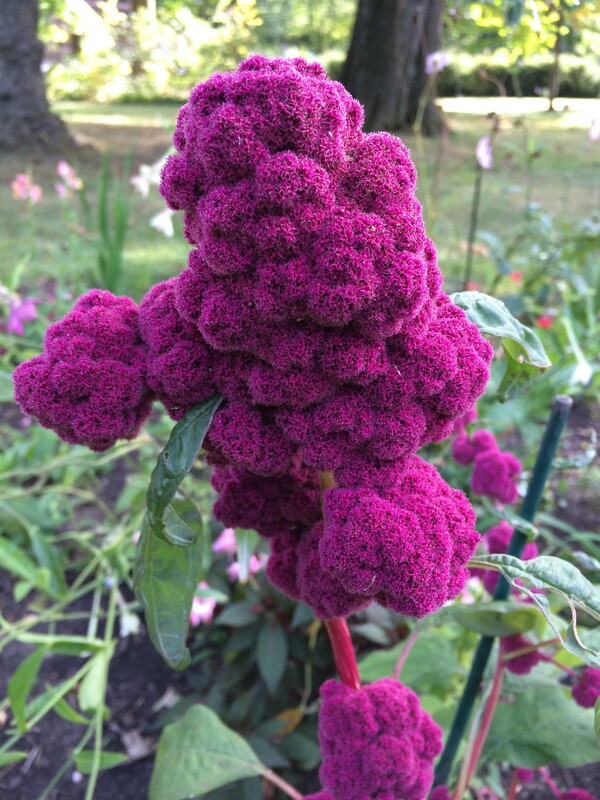 The label said they were called “Love Lies Bleeding” (Amaranthus caudatus). They were gorgeous, and they seemed perfect for her garden. We took a short walk to the cemetery where she is buried. Luckily for us, a quick Google search led us to an article that indicated her family’s plot was surrounded by a wrought iron fence. Otherwise, we’d have had to wander a while, and my husband’s patience was not going to extend that far. We found it pretty quickly after discovering that detail. We took a few pictures of her headstone and the family plot. I placed a rock on top of her headstone. Many people had the same idea before me, as you can see. I read that her niece Martha Dickinson Bianchi had that inscription done some time after (her original headstone had just her initials on it). 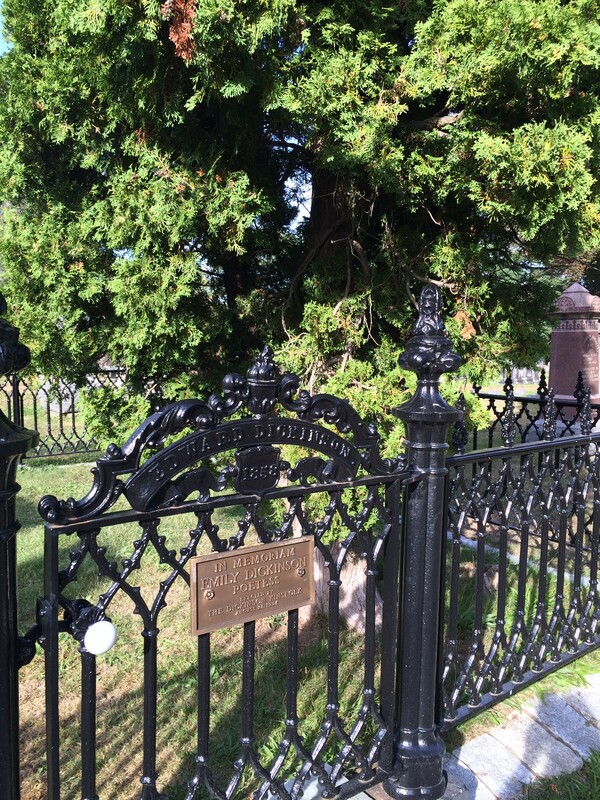 It’s hard to get a good, unobstructed picture of the headstone because of the fence. 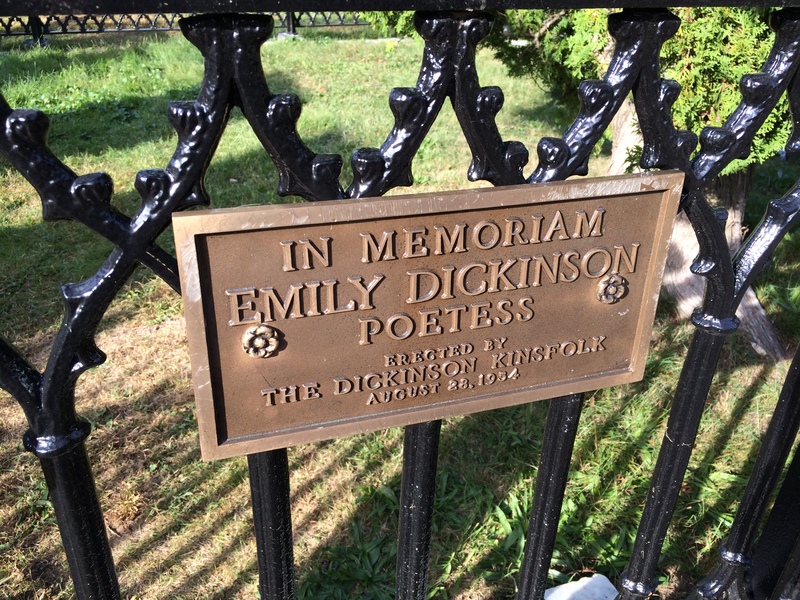 I love that the plaque on the little gate in the fence describes Dickinson as a “Poetess.” One of those archaic terms one never needs to use anymore. There is a really nice tree growing in the corner of the Dickinson family plot. I think she’d like that very much if she knew it. 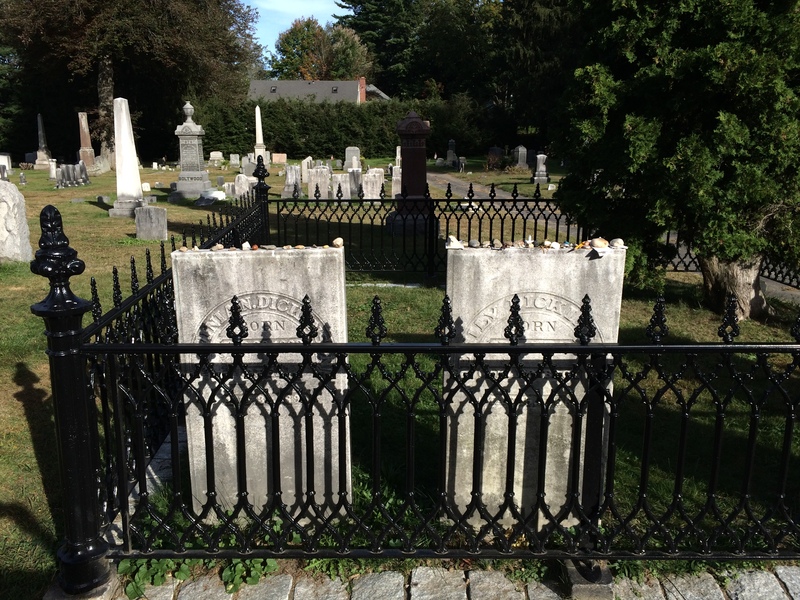 Emily is buried to the right of her sister Lavinia (on the end). I didn’t know much about Emily’s sister, known as “Vinnie,” until the docent shared some details. Did you know it was Vinnie who found Emily’s poems after Emily died and worked to make sure they were published? I had no idea. As you can see, some folks left stones for Vinnie, too. 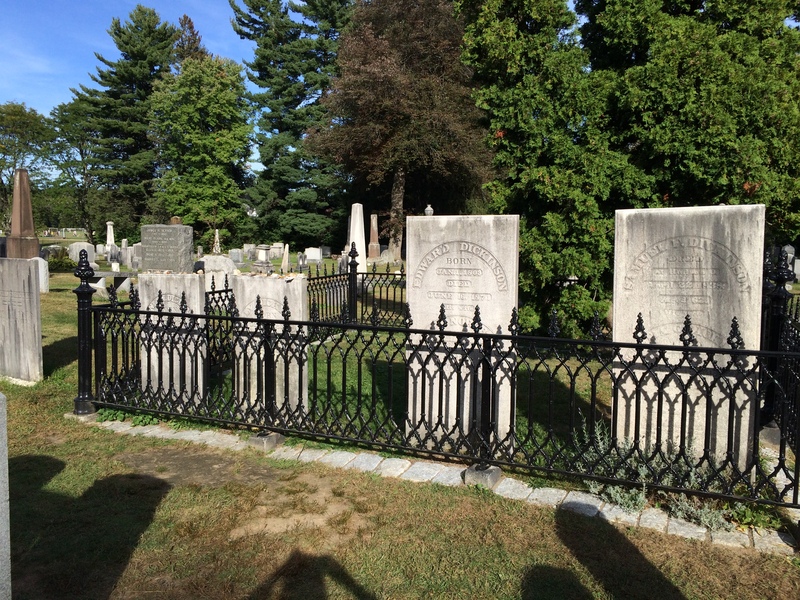 Rounding out the Dickinson family plot are the graves of Emily’s parents (both names are inscribed on the headstone that is second from left). I think the one on the end is her grandfather. I learned a some interesting things about Emily’s writing process from the docent at the museum and even walked away with a good idea for a lesson in diction that I think my students will enjoy. 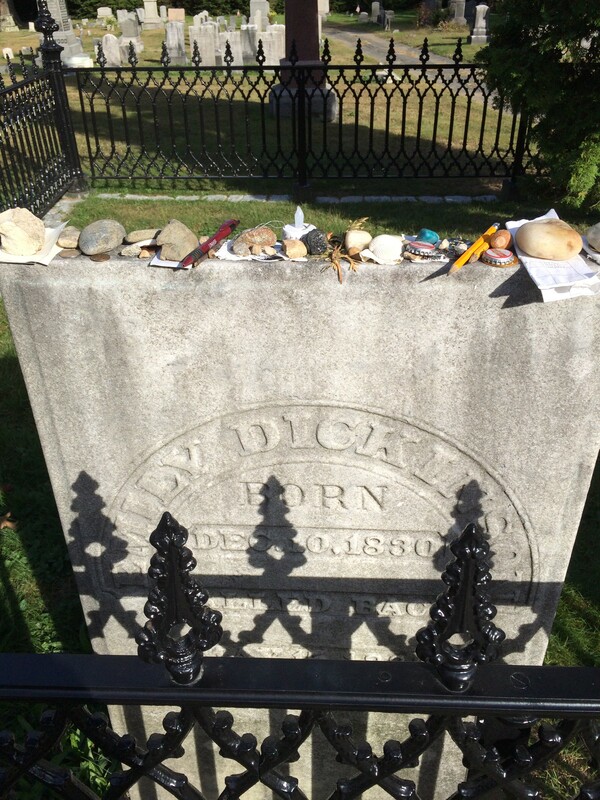 What an incredible opportunity to walk in Emily Dickinson’s footsteps and visit her! 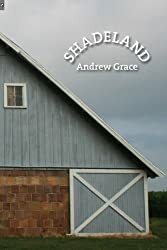 Shadeland is not only the name of the Illinois farm on which poet Andrew Grace was raised, it is also that elusive space where language attempts to recover all that has been lost. Deeply concerned with the state of today’s rural spaces, Grace’s poems describe a landscape and a lifestyle that are both eroding. Stylistically rangy, yet united by an ardent eye for intricate imagery, Shadeland features allusions and influences as classical as Homer, Virgil, and Hopkins while still exhibiting a poetic sensibility that is thoroughly contemporary. Employing a blend of baroque and innovative language, these 21st-century pastorals and anti-pastorals both celebrate and elegize the buckshot-peppered silos and instill cornfields that are quietly vanishing from the countryside. I would definitely agree that the collection is stylistically rangy. Of the poems I liked best, I found myself responding most to the ones that were more like “Field Guide for How to Pioneer the Midwest.” I loved the simple “Pilgrim Sonnet,” which evoked the call to settle the west and elevated it to religious pilgrimage. I’m not so sure it really wasn’t, after reading this poem. I also liked the six-part ekphrastic poem “Dinner for Threshers” inspired by the Grant Wood painting. Possibly my favorite poem was “Z,” which captures with beautiful simplicity the death of the speaker’s father in a farming accident and connects it to “the wind from Illinois” that has shaped and destroyed. It’s really a gorgeous poem. 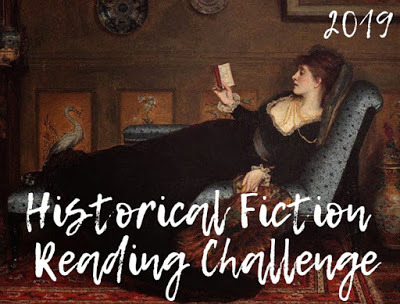 I also really liked “The Outermost Shrine of the Narrowest Road,” “Of Love and Wild Dogs,” “Is to Say,” and “For Tityrus,” all of which I felt were beautifully direct in their language. I think after reading Roger Rosenblatt, I’m noticing the nouns and verbs and the ways in which modifiers detract rather than add. I did try re-writing “Of Love and Wild Dogs” without modifiers in my writing journal, and it has a stark effect, stripping the language in that way. It is something I think I will experiment with in my own writing—drafting it as it comes and then revising to strip the modifiers. I found this article about Shadeland, which is the family farm that gives its name to this collection. It sounds like quite a place, and I can see why it inspired Andrew Grace. He somehow managed to capture so much about farming in America in this collection, from the promise of early settlers to the ever-shrinking endangered family farm. People have a complicated relationship with the earth, and nowhere does that seem more apparent to me than in farming, which has been a metaphor for the human struggle since Adam and Eve were cast out of the Garden. I had more or less forgotten how much I like poetry until going to the Kenyon Writer’s Workshop for Teachers, and now I find myself seeking it out and wondering how I could have set it aside. Andrew Grace’s collection Shadeland was a nice re-introduction. I had the weirdest dream last night. 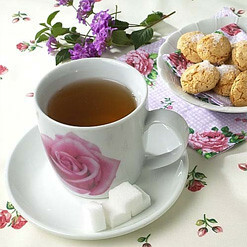 I was the winner of some kind of luncheon or tea with Byron, Shelley, and Keats. There was also another guy at the table, who happened to be a dwarf, and he was a writer, but I didn’t know who he was, and I was too embarrassed about not knowing who he was to ask him who he was. All these dream interpretation websites, which I take absolute stock in, seem to indicate the dwarf represents some underdeveloped or unexpressed part of myself. Keats reached over and squeezed my hand when I sat down. Be still my heart! He was very quiet, but friendly. Actually, I don’t remember he said a word, but he did smile. Shelley, on the other hand, was really flirtatious, but in that way you know is totally insincere. And every time he said something, I kept thinking of Mary Shelley. He kept apologizing for Byron’s behavior and chastising him for not being friendly. Then Byron would snap pissily (if that’s not a word, it should be) back at him. Keats was quiet, Byron was sullen, and Shelley was gregarious. It was really weird. 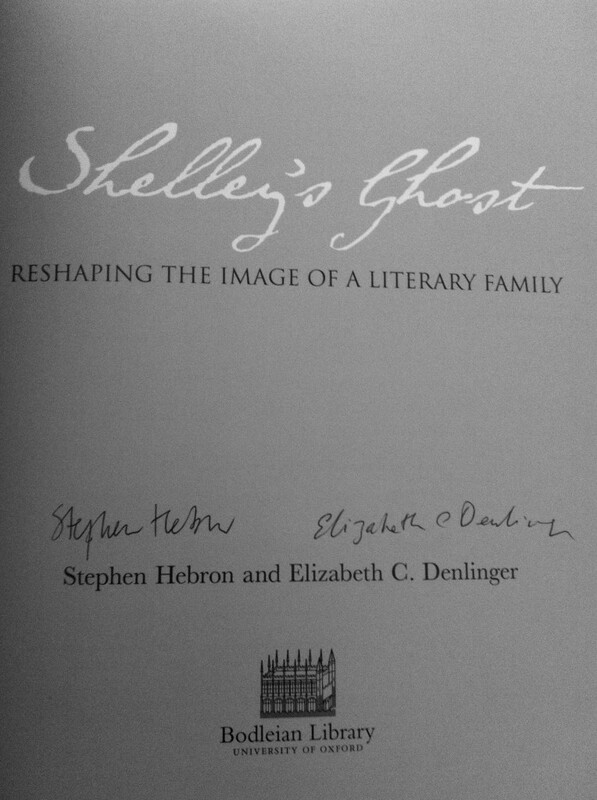 …signed by the authors, courtesy the Bodleian Library at Oxford. 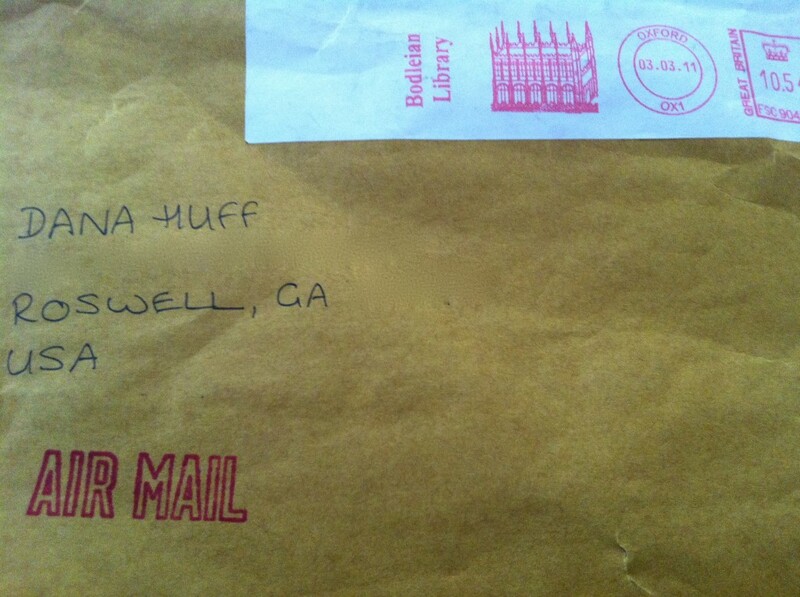 Receiving mail from the Bodleian was really cool. I am going to save the envelope. Note: This image is not the postcard image, which is probably copyrighted, but it depicts the same doors from a different angle. I really wish that weird tea party had been real. Can you imagine? I wrote yesterday about Byron, and despite completely understanding Byron’s appeal, it is Shelley I have the crush on. 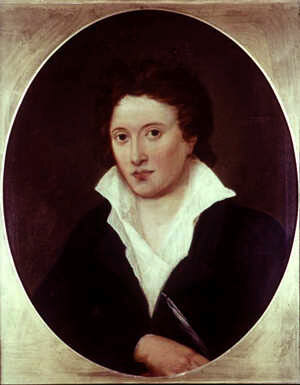 I probably first encountered Percy Bysshe Shelley’s poetry in twelfth grade. I can’t think of any reason I would have encountered him before that time. I did a group project on his poem “Ozymandias” with two classmates. We videotaped ourselves as the Shelleys and his “inspiration,” a basketball player who was past his prime and whose talent would quickly vanish, which I have to say was probably not a bad modernization of the text’s theme. Shopping in the bookstore with my parents, I found a Norton anthology of Shelley’s poetry and prose and had to have it. My dad bought it for me, and he must have been scratching his head over the purchase something fierce because what normal twelfth grader wants a Norton anthology of a British Romantic poet’s work? Even I would wonder what was up with such a kid if I met one today, but I have a sneaking suspicion I was on the extremely rare side in that particular area. So I read some of the other poems in the Norton, and I was particularly entranced by Epipsychidion, a word Shelley made up which means “on the subject of the little soul.” This poem is about S-E-X. It is transcendent, a connection of souls. It’s written for a woman named Teresa Viviani with whom Shelley was quite enamored, but who was inaccessibly confined in a convent by her father. Just imagine! It reminds me of Romeo’s declaration that Rosaline’s decision to “remain chaste” in fact “makes huge waste.” In the poem, Shelley calls Viviani “Emilia,” the name of Hippolyta’s sister as described in The Teseida by Boccaccio. Later, Geoffrey Chaucer would rework the story in “The Knight’s Tale,” and Shakespeare and John Fletcher as Two Noble Kinsmen. Emilia, or Emily, desires to remain chaste also, but she has the misfortune to be spied by Palamone and Arcita, who fall in love with her on sight (because that’s what you do). I am much more familiar with Chaucer’s version of the story, so I’ll discuss it for a moment (still with me? bored out of your skull yet?). In Chaucer’s story, Palamon and Arcite (same dudes, different spelling) are cousins who are like brothers. They are among the Thebans who fought against Theseus’s forces. They are captured and imprisoned in Athens, and it is from their prison window that first Palamon, then Arcite, spy Emily. They fall in love with her at first sight, but they can’t have her because they’re in prison. 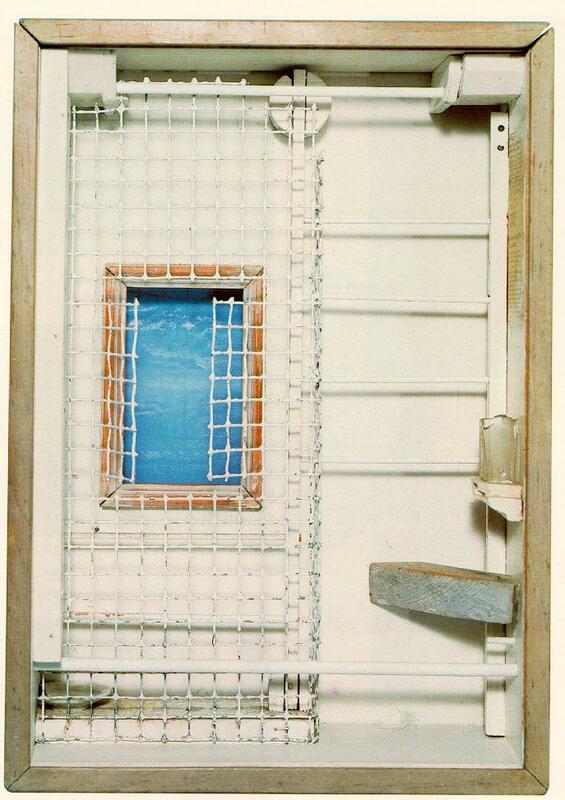 Eventually Arcite is released from prison, but is exiled from Athens, while Palamon remains behind bars. This scenario prompts the Knight to ask the company who has it worse: Palamon, who is imprisoned, but who can still look on Emily’s beauty from his prison window, or Arcite, who is free, but cannot see Emily. I usually ask students how they would answer the Knight’s question. How would you? I won’t go too far into the rest of the story, but suffice it to say the men have really only fallen in love with Emily from afar. They don’t really know her, and in fact, no one really cares what she wants in all of this, which is to be a nun. Women didn’t get to choose so much in Emily’s day, however, so she eventually weds one of the cousins, and I won’t tell you which because I hope you’ll read the story. What Emily represents is the Knight’s ideal—an example of the lady on the pedestal. Of course, the Miller tells his story next, concerning men and women who are a little nearer to the earth. At any rate, Shelley choosing that particular nickname for his beloved is fraught with all sorts of meaning. She is the unattainable Emilia, only she is imprisoned rather than her lover (presumably Shelley). Idealized, not real. Not really Teresa Viviani, but his hope for perfection. He compares his wife, Mary Shelley, to the moon—cold, chaste. Teresa is the sun (can’t help but think of Romeo and Juliet once again). I don’t know why, but I developed a sort of crush on Shelley that has lasted since twelfth grade, over 20 years now. I don’t think Shelley was particularly nice, at least not to his wives, and I’m not sure what it is about him. He is on the page, and his opinions and beliefs shine forth in clear language, but even after all this time, I don’t feel I really know him. He is still a mystery. I am looking forward to seeing how Jude Morgan gives him flesh and life. I have no trouble imagining Byron or Keats as real people, but Shelley has remained elusive. He is, in that way, like Emilia himself. 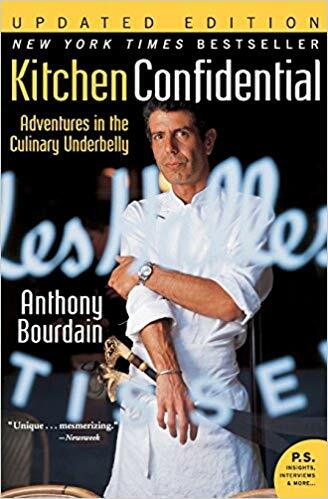 All the descriptions I’ve read of him tend toward the idealized. I hope Morgan is able to make him walk on the ground. 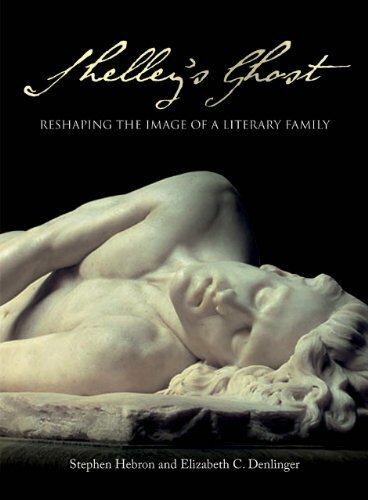 See Shelley’s Ghost: Reshaping the Image of a Literary Family. Melvyn Bragg: Then he left [England] in 1816, as it happens never to return, but he left notorious—he was hissed in theatres, he was hissed in the House of Lords. He was more than a scandal; he was an outrage. They wanted him out—out of the country, off the island. What had happened? Melvyn Bragg: And that got out. Melvyn Bragg: What credence do you give them? Emily Bernhard Jackson: I would say he certainly had an affair with his sister. I would stay that’s beyond question, although he didn’t announce it to the world. I give full credence to all of them. I think it says something kind of weird about me that I laughed when Professor Jackson said that last sentence, mainly because she set it up to sound like a smear campaign headed by Lady Byron, Annabella Milbanke, but a true one. 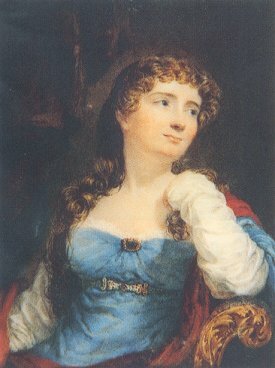 Caroline Lamb famously described Byron as “mad, bad, and dangerous to know,” and Melvyn Bragg and his guests hypothesized that Byron’s bad-boy reputation helped move copies of his books off the shelves. The Corsair sold 10,000 copies on its first day, apparently. 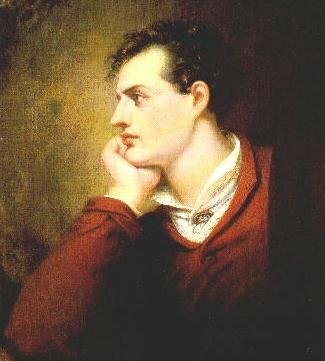 Byron will also be a character in the book I’m currently enjoying immensely: Passion by Jude Morgan—the story of the Romantic poets Byron, Shelley, and Keats as told through the voices of the women who loved them. I have to admit that when I teach Byron, I can be somewhat irreverent, and it is my hope that Byron, wherever he is (I’m sure many folks would say hell), enjoys it a little. I think he liked being famous. One of my favorite ways to describe Byron’s death is that he was bored, so he decided to sail for Messolonghi and fight for Greek independence because that’s what you do. He sounds like he would have been one of those guys who was fascinating to have as an acquaintance, but maddening to have as a close friend or lover. Kay Redfield Jamison, a clinical psychologist, expert on bipolar disorder, and author of Touched with Fire and The Unquiet Mind, speculates that Byron was bipolar, which would explain a lot about some of the choices he made in life. It also explains much of his behavior—by turns magnetic and charismatic, then frightening and cruel. Certainly he describes suffering from melancholy. I leave you with some audio of one of Byron’s most famous poems, “She Walks in Beauty,” set to music by Isaac Nathan. Nathan’s melodies for Byron’s poems (Hebrew Melodies) have largely been forgotten, but Byron’s poetry remains. This audio is from Romantic Era Songs.